When Sybase SQLAnywhere 12 database server is installed, it will come with a sample database called “demo”. Let’s create a Web Site Factory application from this database. First, download SAP Sybase SQL Anywhere 12 for Windows x64 from the Sybase website if you have not done so already. Download the file and follow instructions to install the database server. 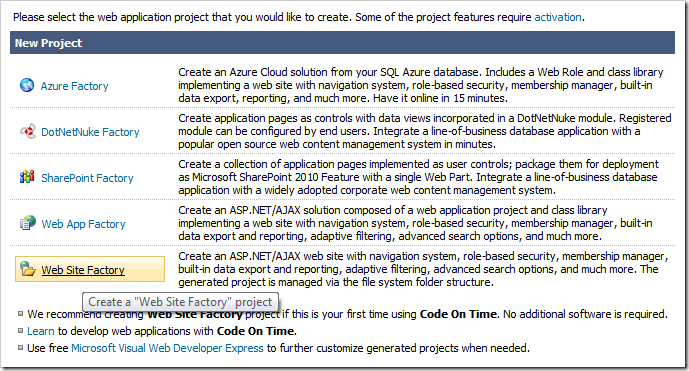 Start Code On Time web application generator. At the bottom of the page, click on Create a new web application link. On the New Project screen, select Web Site Factory. Assign a name of “SQLAnywhereDemo”, pick the programming language of your choice, and press Create. Press Next to reach the Database Connection page. From the Data Provider dropdown, select “.NET Framework Data Provider for SQL Anywhere 12”. Paste in your connection string in the field below. The next page allows configuration of Custom Membership and Role Providers. Leave the default settings and press Next until you reach the Theme page. Select “Vantage” from the list. Hold down Shift key and press Next to skip to the Summary page. Press Generate. When generation finishes, the web application will open in the default browser.